Random House Trade Paperbacks, 9780812982060, 240pp. If you thought you had white people pegged as Oscar-party-throwing, Prius-driving, Sunday New York Times–reading, self-satisfied latte lovers—you were right. But if you thought diversity was just for other races, then hang on to your eco-friendly tote bags. Veteran white person Christian Lander is back with fascinating new information and advice on dealing with the Caucasian population. Sure, their indie-band T-shirts, trendy politics, vegan diets, and pop-culture references make them all seem the same. But a closer look reveals that from Austin to Australia, from L.A. to the U.K., indigenous white people are as different from one another as 1 percent rBGH-free milk is different from 2 percent. Where do skinny jeans and bulky sweaters rule? Where is down-market beer the nectar of the hip? 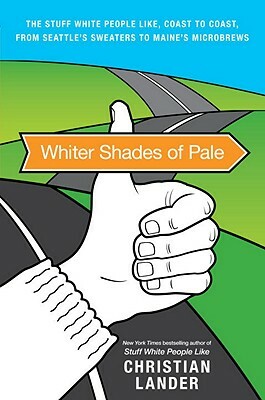 If you want to know the places cute girls with bangs and cool guys with beards roam and emo musicians and unpaid interns call home, you’d better switch off the Adult Swim reruns, put down that copy of The Onion, pick up this book, and prepare to see the white. Christian Lander is the creator of the popular blog StuffWhitePeopleLike.com and the author of the New York Times bestselling book Stuff White People Like. A one-time Ph.D. candidate and acclaimed public-speaking instructor, he has traveled extensively in the United States and Europe, living among white people and studying their native customs. He presently resides in Los Angeles, where he enjoys such local pleasures as Ray Ban Wayfarers, skinny jeans, yoga, interior design, and crippling debt.